Drive through the rolling hills of a game ranch to spot hippo, rhino, giraffe and many species of antelope. Lunch at a restaurant in the area. 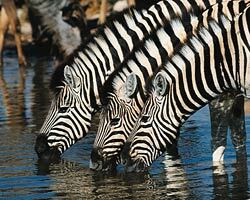 Travel on to a private game reserve. Afternoon game drive through the thornveld and savanna of this scenic reserve inhabited by rhino, giraffe, zebra and a variety of antelope, amongst many other species, as well as prolific birdlife.